Jack Karp. Photo courtesy of Red Fern Theatre Company. Jack Karp's Irreversible, playing now at the 14th Street Y theater, concerns the Oppenheimer brothers as they race against the clock and the Nazis to construct "the gadget," the atomic bomb that would go on to famously end the war and bring in a new era of worldwide conflict. Playwright Karp is no stranger to writing about heavy historical subject matter with past productions like Incendiary Agents and Tell Me You Love Me, but he is not merely interested in educating an audience with lesser known details of famous historical events. As any audience member can see from watching one of his plays, mankind can't seem to help but make the same mistakes over and over again as the past begins to look startlingly like the present. Karp's ability to make the past relevant to today while still telling a fact-based and emotionally engaging story is one that sets him apart from the rest. 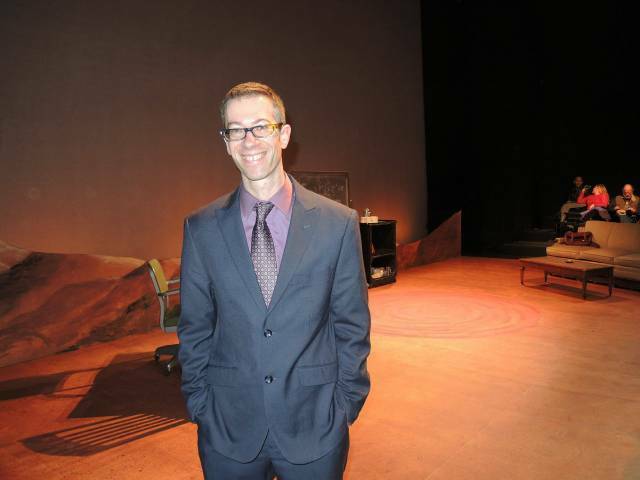 Mr. Karp was happy to take some time out of his schedule and sit down with us to discuss his new play and his ultimate mission as a political playwright. Don't let his subject matter fool you, he is a delightful and humorous man to talk to. What attracted you to the Oppenheimer story? That's a good question. Robert Oppenheimer has been bouncing around in the back of my head for a really long time for no reason I can give other than that I've always been fascinated with him. When I started writing this play I didn't actually sit down to write about him or the Manhattan Project. I gave myself an assignment, a structural exercise. I wanted to write a play based on the idea that everything in the first act built up to a climax and then the second act everything that happened in the first act kind of worked backwards, with the characters trying to undo what they had done in the first act. But it happened pretty quickly in the writing process that I started to realize that Robert Oppenheimer was what I was writing about, so having him in my head to begin with and working on this exercise, the two kind of merged. And one of the reasons I chose to keep going with this story is because I also think it’s really relevant to a lot of the stuff that’s going on in the world right now. So it was your intention to make it relevant to modern day? Absolutely! And I definitely think that, in general, when you’re writing history plays or novels, I do think that it’s always a good idea to find things about that story that make it relevant to today. One of the pieces of intelligence that drove them to build the bomb was this idea that the Nazis were importing all this uranium out of Africa into Germany, so they assumed that meant they were making a bomb, which is incredibly similar to what George Bush said in the State of the Union about Iraq getting all of these aluminum tubes and uranium out of Africa to come to Iraq to make nuclear weapons, which of course turned out to not be true. Exactly! So to be honest it wasn’t that hard to find parallels, sadly enough. Jordan Kaplan in Irreversible. Photo courtesy of Red Fern Theatre Company. Your last play, Incendiary Agents, was very political too. Do you find that you lean towards that often when you write? I definitely do. I never set out to write history or political plays, but as I’ve gotten older and write more I find that my writing has gotten more and more in that direction. I think this is something that comes with age, the thinking you start to have that you’re running out of time to write, that if you’re not going to write about something that’s important, then you’re wasting your time. Like it needs to be something that’s important and is relevant to a lot of people, relevant to the country and the world. Definitely as I get older I have less interest in writing about, you know, my family, or roommates or something like that. I feel like I really want to write stuff that’s important, so I definitely find myself going more and more in that direction. Now if I remember correctly, you were commissioned to write Incendiary Agents? I was, I was commissioned by a theatre company called Nylon Fusion Theatre, which I had worked for a bunch of years before on smaller projects, and so they asked me to write a play. They actually specifically commissioned a political play, which worked out really well because I had been trending in that direction, so it turned out to be a really good fit. They wanted something that took place in the late 60s/early 70s, which is how I came to write about the draft riots. It’s hard to avoid writing about Vietnam when given that time period. Exactly! I researched the period and obviously there is a lot of stuff going on, but the draft board raids really caught my attention and I felt really compelled to write about that. Similar to Irreversible, I felt like there was a lot of relevant commentary to what is going on now. There was so much anti-war protest and people were risking their lives and their freedom to protest the Vietnam War, and it really shed a lot of light for me on what was going on now with us going into Iraq and Afghanistan and how come there isn’t that kind of protest now? How come we don’t see people standing up and risking their freedom, risking their lives, going out in the streets? So I wanted to use that play, at least in part, as an exploration of what protest is. What causes people to protest, why don’t people protest and why aren’t there people protesting now? The draft is pretty common knowledge but few have heard about the draft raids which you wrote about. Right, that’s true. I didn’t know anything about the draft board raids until I started researching it, so that’s also one of the things I found interesting about it, and kind of compelling is that opportunity to educate people. 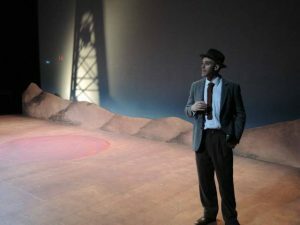 I don’t think of my plays as being educational, or certainly not being didactic in that way, but I do think one of the things I really enjoy about these last few plays, and writing in general, is that feeling or that sense that when the audience leaves they know something they didn’t know before. Both with Incendiary and with Irreversible I have people in the audience come up to me after and say “Oh, I didn’t know that” or “I didn’t know that that happened,” and I find that incredibly fulfilling. I like that idea of not only entertaining people but also educating them about our history and about our culture and politics, and I think audience members like that. Most of them seem very grateful when they come out of a play having learned something and not just entertained. Jordan Kaplan, Amelia Mathews, and Josh Doucette in Irreversible. Photo courtesy of Red Fern Theatre Company. Right, because now they have something they can educate their friends with. You’re making them feel smarter, and everybody likes to feel smart. Yeah, it definitely helps when you make an audience feel smarter! Like with the Oppenheimer story. Everybody knows they built the bomb, but very few know about the backstory. Robert’s affair with Jean Tatlock, for example, I didn’t know anything about. Yes, I think that many people know just the basic broad outlines of the Atomic Bomb and the Manhattan Project. And again, these are all details I didn’t know anything about until I started researching, so basically you learned something and you didn’t have to do any of the work, I did the work for you, so it’s pleasing. As a playwright, is there a play that you love that you wish you had written, that you could take credit for? Oh my god, that is a great question actually. There are hundreds of plays that I wish I had written. Angels in America is one of my favorites. Definitely Angels, that would be pretty high at the top of the list. It’s just such a big epic play, and it manages to walk a line very well, that I try to walk, between being political and being personal. I feel like [Tony] Kushner just walks that line in that play so well, like it’s making political statements but it’s not knocking you over the head. That play is really about the relationships between the characters, but it still gets across that political message. It’s also really beautifully written and really poetic. So yeah, if I had to pick one, and like I’m saying there are hundreds of plays I feel that way about, that’s the first one that comes to mind, Angels in America. Do you have any advice for up-and-coming playwrights? The biggest piece of advice I would have for a young playwright just starting out is to get your work up. Get it on stage. I made the mistake of spending the first few years of my playwriting career just writing stuff and sending it out in the mail to theatre companies and just hoping and waiting for them to get back to me and say “yes we’re going to do your play,” and of course that never happened, and as a result I had very little on stage for a few years. It’s very important to have your work on stage because that’s how you learn as a playwright. So if you want to be a playwright you need to, like, get your acting friends together and have them do readings, have them stage shows, self-produce if you have to, try and get attached to a small theatre company that does new works, save up to rent a theater space. Do it yourself if no one else will. 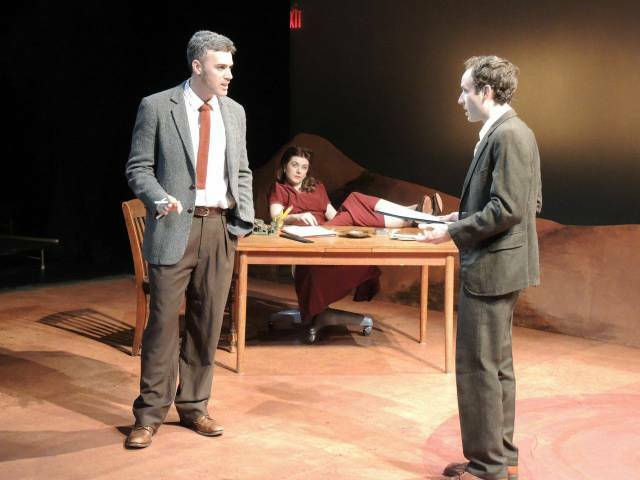 The Red Fern Theatre Company presents Jack Karp's Irreversible from now until March 29th. Jack Karp's Irreversible continues its run at the 14th Street Y theater through March 29th.